Dr. Derek Porter and his staff welcome you to West Fourth Chiropractic! Dr. Porter attained his Doctorate of Chiropractic (DC) from Canadian Memorial Chiropractic College (CMCC) in Toronto and has been helping individuals lead healthier lives since 2002. As a high performance athlete, people often assume I “treat” a lot of athletes. I do see many athletes in my practice, however, not the way you might think. My goal is always to raise the health of my practice members not just treat injuries. When you look after your spine and nervous system, you perform better in life, period. The benefits of chiropractic are much more than the treatment of just aches and pains – although it is good for that too. We really don’t have to get sick or injured in the first place to start living a healthier, better life. Ready to take the next step and learn more about chiropractic care? Take some time to look around our website and then give our Vancouver chiropractic office a call to schedule an appointment and get started today! 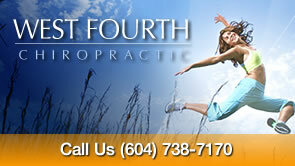 Serving the Vancouver, Kitsilano and West Side Vancouver areas with natural chiropractic care since 2002. I liked how comprehensive the initial assessment was. It provided some very helpful information. Dr. Porter is very personable and listens to my concerns. I liked the fact that he did a scan of my spine and took the time to explain how my back works and why I am feeling the pain I am. I would recommend him to anyone. Thank you. Dr. Porter and staff for an excellent start. Dr.Porter is extremely thorough and very competent. His athletic background and knowledge base gives me the utmost confidence in his ability to help me. Just like the old-fashioned way of being able to ask questions as per desired and being given frank answers. As well, the follow-up exercises were very adequately explained: the how and why. the actual treatment was really appreciated. The examination by Dr. Porter was very thorough and he presented my case in a very integrated and accessible way. It gave me the confidence that he can really help me out. Thanks for helping me get fully functional again. I like the use of quantitative testing to show problems areas visually. Very nice and professional care. I felt relief on the first visit. Friendly and caring! Took the time to explain everything because I was curious. I’m sending all my family! I was so impressed with Dr. Porter’s knowledge and expert care.